Let us all take a trip back to 2008 when the film King dropped. It was a time when a Kona Venkat script was moderately amusing at the very least. At a juncture in that film, the fervently typecast Narsing-anna indulges in a rather rib-tickling piece of discourse with the late Srihari. The former tells the latter about a yesteryear film he'd watched where after a night of "mast daawat", the triplets of a wealthy couple were separated as nature itself considered triplets an abomination. One of the young scamps lodged himself at the residence of a decent man while the other two ended up with a street-hustling poor man and a janata-terrorising bad man respectively. The crux of Narsing-anna's story followed the three brothers as they tried to rekindle the bond between them. Director K S Ravindra seems to be an ardent fan of brother Narsing's narration of that tale as the former attempts to wring life out of this excessively fermented wine with latest venture Jai Lava Kusa. While the throwaway gag from the decade-old film did quite an admirable job at concisely explaining the skeleton of this film, I'll add the requisite flesh and blood. A lisping yet talented Jai is marginalised by his drama enthusiast brothers and uncle. Jai's quivering rage is fanned by the bane of societies everywhere - the dear old grandmother. The old lady's quoting of the scriptures acts as the herald to Jai's shift to the dark side. One botched murder attempt later, the trio are split, and grow up in different environments. And when Jai/Raavan's political and romantic ambitions come to the fore, he enlists the help of his estranged brothers (in his own way) to aid his campaign in more ways than one. This synopsis happens between the first few minutes of the film and the second half. The opening hour is a mishmash of plotlines comprising two terminally uninteresting brothers, a critically brain-dead Pradeep Rawat (he accepts a 5,000 rupee note, for f***'s sake) and a whole host of sub-plots which are literally kicked to the kerb as Sai Kumar enters the fray to jumpstart the story proper. Why did we need that first hour? Do we care about the plight of those passive pair of twins? No - and neither does the film, because NTR quoting NTR is what draws the crowds. As Jai - or his rechristened self Raavan - enters the picture, those unwashed masses who were a part of Bavji's administration in Vikramarkudu have a new face to fear. No, it is not the who-is-scared-of-you-anymore trio of Ronit Roy, Sharath Lohitashwa or Abhimanyu Singh but Raavan (Jr NTR) himself. Because Tollywood has neutered its bad guys by having them beaten up by the righteous do-gooders one too many times, the only force strong enough to stop an angry not-so-young tiger is a duo of not-so-young tigers. While Jr NTR does his best to elevate material which can easily be classified as S S Rajamouli's literary backwash, the film writes itself into circles by not having a true protagonist to carry its 150-minute runtime. By anointing Jai as a blight to functioning society, his adversaries only come off as the lesser of two evils, while his one-note brothers act as mere cardboard cut-outs whom no one but their romantic interests could plausibly adore. Amidst the over-acting, under-acting, wasted Sai Kumars, item songs about shaking and call-backs to Sr NTR's opuses, the almost-old tiger seems to find his stride in pulses. With every moment envisioned to elicit genuine laughs and every scene of posturing laced with Rajamouli's rejected weapons, Jr NTR tries to put his best foot forward in an attempt to make the audience empathise with his many characters. The commitment is admirable. Bolstered by a bevy of low-angle shots, loud background music and CGI seemingly rendered on the very first iteration of Adobe Editing Studio, the film crumbles under the immensity of its unfocused structure. Harkening back to the LSD-fuelled heydays of Mithun Chakraborthy, the movie loses all cleverness as it weaves plot points in and out of its narrative with no thought for how each part affects the narrative as a whole. Multiple interesting setups are wasted as sub-plots and a genuinely poignant character piece about the all-consuming nature of rage is wholly under-developed and under-utilized. Oldboy, we shall never see the likes of thee. Watching Nivetha Thomas who was an integral part of one of the mature new wave hits Ninnu Kori and Posani Krishna Murali who acted as the embodiment of human conscience in Temper being grossly misused in a run-of-the-mill masala potboiler shows how films like Jai Lava Kusa are rapidly aligning themselves with a dying breed of cinema to which a merciful shot to the head is long overdue. This movie hit the theatres at the most opportune of times. With the big holiday week of Vijayadasami on the horizon, a superstar in the cast, and augmented by said superstar's hugely popular turn as the host of Bigg Boss, it had an enviable list of advantages checked. As we all know, that kind of expectation is rarely if ever fulfilled. 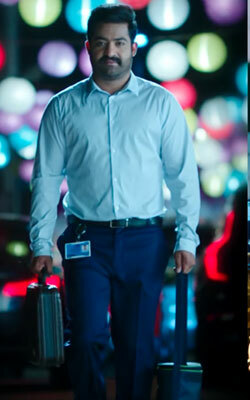 Quite honestly, this movie can be enjoyed if you, at the very least, appreciate Jr. NTR's work. You don't even need to be a fan. And one must also convey that this is a Bobby-Kona Venkat movie so the basic logic and application of physics goes out the window. I'm not big on "commercial movies" but this one actually had me engrossed in the proceedings because of NTR's performance. And not just the character of Jai. His versatility was shown with Lava and Kusa too. NTR is not the problem with the movie. He is actually its best part. The horrendous script and pacing are the issues here. I don't accept the argument that because it is a commercial film, basic tenants of storytelling can be sacrificed. To me, that is an insult to the audience who pay their hard earned money to watch the film. Kona Venkat has actually entertained me before with his earlier work with Srinu Vaitla. Commerical/Mass films need to connect to primal emotions of a people. Most Rajamouli films are not high art. They are mass cinema. They work because they never forget to build engaging stories and relatable characters. This film is in no way trying to do that. All it wants to do is coast off NTR's (JR and SR) popularity and skill. That is a failure on the part of the filmmakers whose job it is to build narratives with unique structures. But I don't think you grasped what I was actually trying to say. I've never been fond of these commercial/mass movies, they're just not my cup of tea. That's just my personal take on it. I'm just saying that this film had my attention till the very end because of NTR and only because of NTR. I'm not appreciating the filmmakers or think this is a well-made product by any means. I did understand your stance Kanye. My response wasn't appropriate though. My apologies. I wholly agree with you, NTR is very engaging throughout. fullhyd.com has 700,000+ monthly visits. Tell Hyderabad what you feel about Jai Lava Kusa!